As part of the Obama administration strategy to deal with the challenge of climate change, the Environmental Protection Agency plans to issue a new regulation today aimed at cutting emissions from the nation’s coal-fueled power plants. 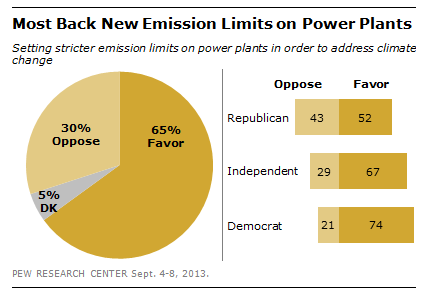 The move is likely to meet with political and industry opposition, but in general, the public favors the idea of stricter limits on power plants. The new EPA rule will mandate cuts in carbon pollution by 30% by 2030 from levels that existed in 2005, according to the New York Times and other news reports. The Times called it “the strongest action ever taken” by the government to fight climate change. President Obama decided to go the route of issuing a regulation because he has little chance of getting his climate change proposals past the Republican-controlled House. About two-thirds (65%) of Americans favor stricter emissions limits on power plants in order to address climate change, according to a Pew Research Center survey conducted last September. But while about three-quarters of Democrats support stricter limits, that view is shared by only about half of Republicans. While coal is still the single largest fuel source for U.S. power plants, its share has declined sharply in recent years, as older coal-fired plants have been shuttered in favor of newer plants fueled by natural gas. 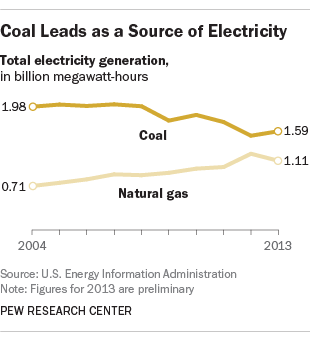 Last year, 39% of U.S. electricity was generated by coal, down from nearly half a decade earlier (though coal has regained a bit of that market share recently). By 2035, natural gas will surpass coal as the largest source of U.S. electricity generation, according to U.S. Energy Information Administration projections. One reason electricity generators are switching to natural gas is that it produces far less carbon dioxide, a potent greenhouse gas, than coal does. 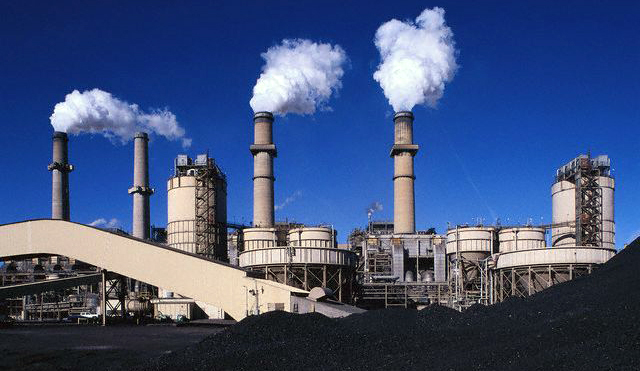 Coal accounted for nearly three-quarters of all power generation-related carbon dioxide emissions in 2012, despite generating about 40% of the nation’s electricity, according to the EIA. Natural gas accounted for nearly all the remaining generation-related carbon dioxide. A Gallup poll conducted in March had result similar to The Pew Research survey, although its question tested support in general for setting higher emissions and pollution standards for business and industry. In that survey, the public supported stricter standards by 65% to 35%.